Three weeks ago we welcomed baby Ryan into our family. While I am enjoying snuggling with him and spending time with my other two kids, I have some special guest bloggers scheduled to share some great posts with you! Today I am so happy to have Petunia from Go Kid Yourself sharing a post with us. 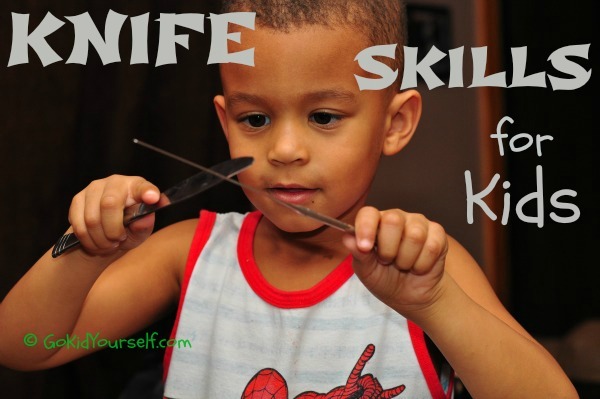 This post comes at the perfect time since we have been working on trying to get my son to improve his knife skills. There are some great simple ideas in this post. 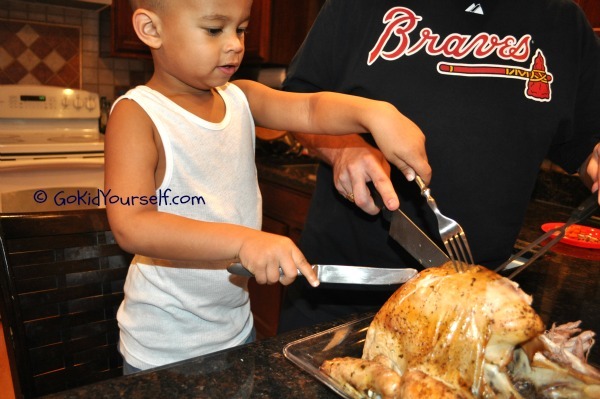 If you start practicing today, maybe your little one can do some turkey cutting tomorrow! Welcome Petunia! I'm Petunia, the Mommy blogger at Go Kid Yourself, and this is my 4yr old son.... we call him The Chief. We're so tickled to have the chance to share with you one of our fine-motor activities.... Knife Skills! I just set out a few butter knives and forks, real and plastic, and foods with various textures and thicknesses. Practice cutting soft foods like bananas or cheese. Hahaha, make sure you excuse yourself everytime you cut the cheese... pee-ew! 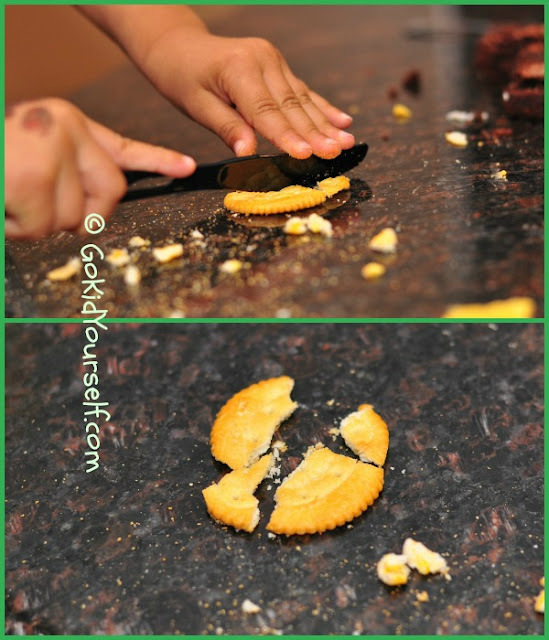 Cut or chop crunchy foods to see and feel that it breaks or crumbles rather than slices apart. Daddy told The Chief he can share this brownie if he cuts it into 2 pieces. 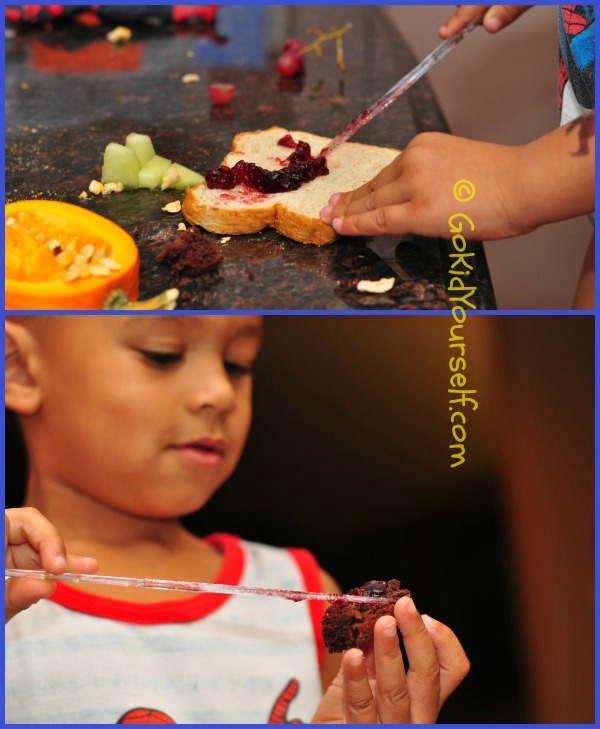 Scooping jelly with a knife is a little tricky. He discovered it's easier if you hold the jar with the other hand rather than have it on the counter where the jar just slides around. Practice spreading jelly on different textures... like a slice of bread, a little piece of brownie, a round pumpkin, a wet slippery melon, etc. Spread whip cream on a brownie and feed it to Daddy... making sure you pull back in time so Daddy doesn't eat your hand... CHOMP!! Practice saw-cutting something slippery like an apple, a hot dog, or a melon.... moving the knife back and forth with one hand while holding the food steady with the other hand. Practice making two halves by saw-cutting a soft slice of bread. I used a "big people" knife to cut this pumpkin after he realized his little butter knives were no match. 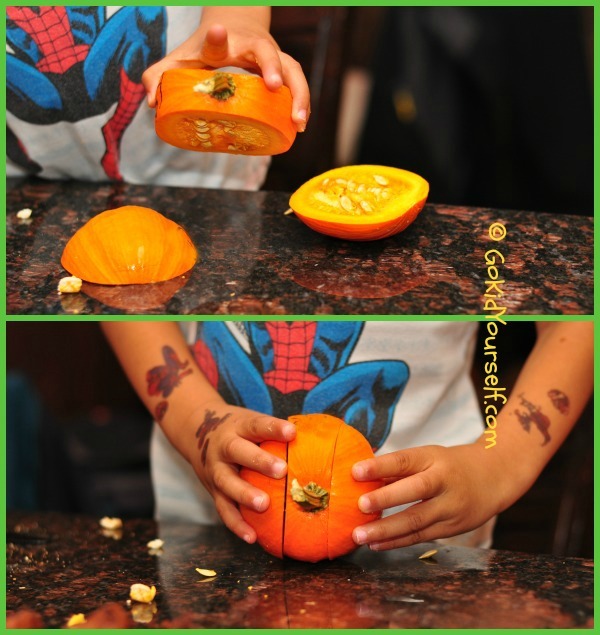 We talked about how the pumpkin is cut into thirds but you can put it back together to make one whole. I also pointed out that 3 friends can share one whole pumpkin if you cut it into 3 pieces. Using a knife and fork simultaneously was difficult for The Chief at first. His little hands couldn't figure out how they wanted to grip each tool. But his grip and cutting technique soon improved just by watching us everyday at the dinner table. It also helps that I let him assist me when I'm preparing foods that need to be cut... like when we make lunch in The Chief's Deli. Knife skills come in handy at Thanksgiving. Thanks Petunia! You have shared so many great real life opportunities where kids can practice these skills. **Parents- please remember to use common sense as you teach these skills to your kids and make sure that children are ALWAYS supervised when they are doing activities like these. You know your own kids and their abilities, so only use materials that they can safely operate... and of course, have fun! Petunia is a SAHM, a military wife in Washington DC, and a Mommy blogger. She blogs about her 4yr old son, The Chief, showing the world how fun it is to be a kid. She believes EVERYBODY should be one! Love this - such a great skill to teach. My child goes to a Waldorf school and has been cutting fruit and vegetables since preschool. 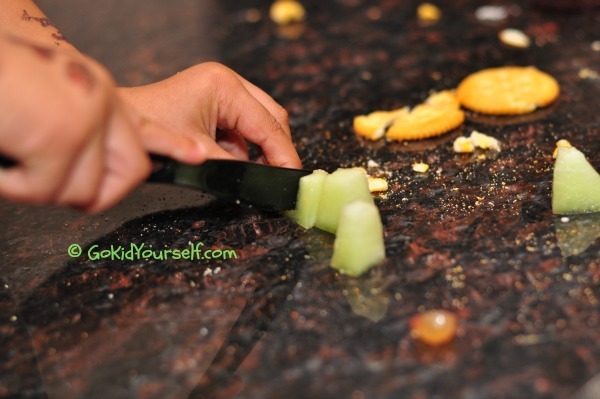 Knife skills are great especially since you teach your kids how to use a knife correctly and a safe knife! Future chef you got there! !